Visual Lure recently launched a new website for Cricket’s Photo & Cinema. Cricket’s is a premier photography studio serving the greater Orlando, Florida area with its studio located in Winter Garden. We originally designed Cricket’s logo a couple years ago, and they came back to us when they were ready to improve their online presence. 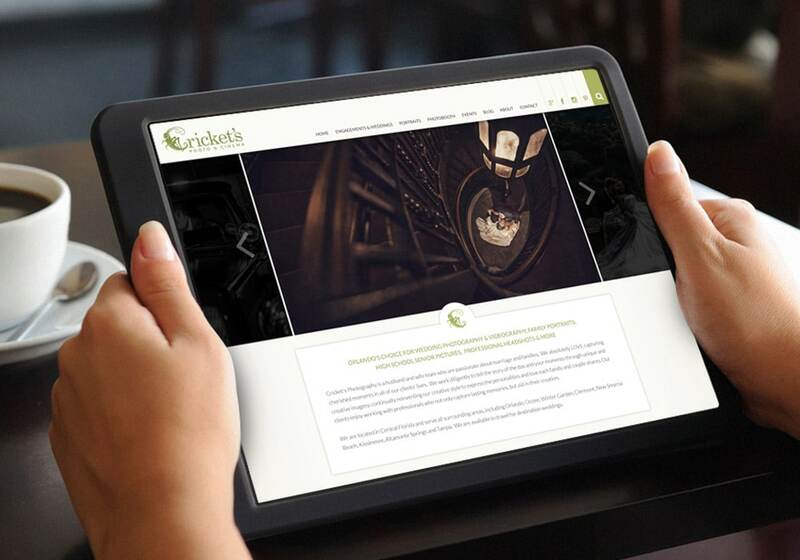 The new website was built in WordPress utilizing a fully custom, search engine optimized, responsive (mobile, tablet and desktop friendly) design. The old website (home page shown above) was not very user friendly. The blog was completely hidden, only to be found if you hovered over the four images towards the bottom of the home page. There were too many main navigation tabs, some links where the same color as the background, therefor completely hidden unless you accidentally hovered over them. The photo galleries and blog landing page took forever to load and the site wasn’t properly search engine optimized. Lastly the old template limited how content could be displayed and gave the site a generic cookie cutter feel. The new home page design in much more content rich, which is great for search engine ranking, along with enticing users to click deeper into the site. The sticky header, as mentioned above, allows the user to navigate the entire site at all times – no matter how far down they scroll. Social media tabs are tied directly into the navigation bar, along with a slider search field. Below that is an easy to maintain slideshow and a custom testimonials section. Next we added a “Types of Photography” section allowing users to scroll/slide to any of their services. 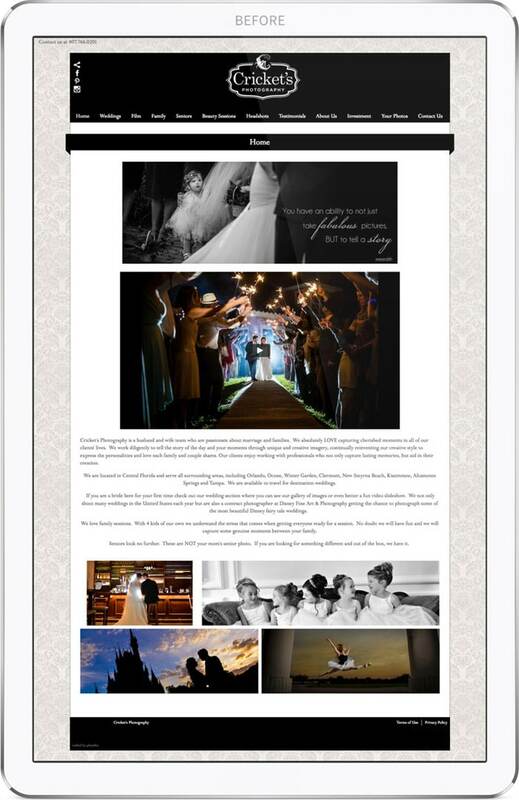 Following is a videography and wedding tips area, and the homepage is completed with a latest blog post and affiliation section.